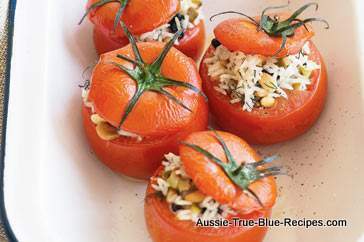 Cut the tops off the tomatoes, and put to the side for later decoration. Remove the seads from the tomaotes with a small teaspoon. Scoop out all the flesh and chop finely. Put the chopped tomato in a pan. Add the sweetcorn and the white wine. cover with a close-fitting lid and simmer until tender. Drain the excess liquid. Mix together all the remaining ingredients, except the olive oil, adding salt and pepper to taste. Carefully spoon the mixture into the tomatoes, piling it higher in the centre. Carefully place the tomato tops on top of the mixture at an angle. Sprinkle the oil over the tops, and arrange the tomatoes in an ovenproof dish and bake at 180°C for 15-20 minutes until cooked through.